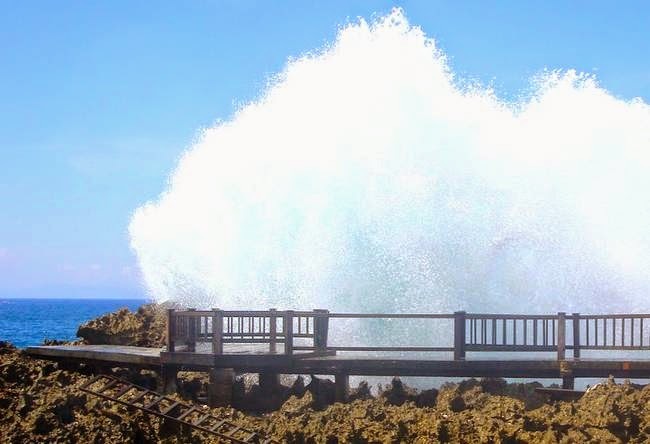 Blow Water in the BTDC, Nusa Dua, is an interesting attraction, but suspenseful, too dangerous. Sometimes people would be negligent if it is in a beautiful and amazing place, like in this attraction, Water Blow. This attraction has caused many casualties among local and foreign tourists. Blow Water attractions located in Nusa Dua, on the BTDC area. To get to this attraction, from the Ngurah Rai airport head south. You can go through the toll roads that pass over the sea. Sign in to BTDC area, with through checkpoints fairly tight. Navigate your way to the Grand Hyat hotel, park your vehicle in side the hotel. Then walk to the Water Blow. Water Blow is a headland in the form of a cluster of rocks. The rock has a big gap, when it gets a strong push by the waves of the sea, the sea water gushes up in the gap. There are two strategic places to see the sea water bursts. The first point is a splash of sea water will fall just above the body. On the first point is already built bridges of concrete with iron barrier. On the second point, bursts Water Blow will not be on the visitors. However, the sea water spray can be seen, it needs a little out of the comfort zone and standing on coral, provided it is not too far to the end. According to the stories of local residents, Water Blow Nusa Dua has a magical feel of a very large and included in the haunted area. Only a few people who know the nuances of the magical and eerie at this attraction. According to local residents, many who became victims of the blast wave from Water Blow. When we crossed the path of a width of not more than 10 meters, on the right and the left, we will see sea waves very hard. The road is flanked by two beaches. According to the story, many tourists who almost fell and drowned as a result of out of the safe zone, towards the end of the rock. When exposed to ocean waves, they fell and dragged the ocean waves. 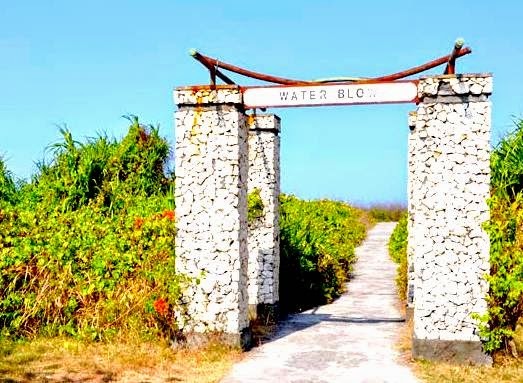 Although not bernah heard about the death due to exposure to ocean waves in this wsiata object, but it has been known that this place is very dangerous and requires high caution so as not to become a victim. Attractions of Water Blow Nusa Dua, often used as a place to jog and enjoy the sunset by the tourists. If you are in this place, you will hear a very loud waves. The roar of the sea water in the crevice between the rocks made the atmosphere very terrible and sometimes tense, when the sea waves hitting the rocks. At night, the rumbling sound of the ocean waves in this place sounds up to hundreds of meters. At night the road to Water Blow closed to the public, to prevent things that are not desirable. Because this is very dangerous wsiata object. During high tide, the sound of the ocean waves will be increasingly hard. 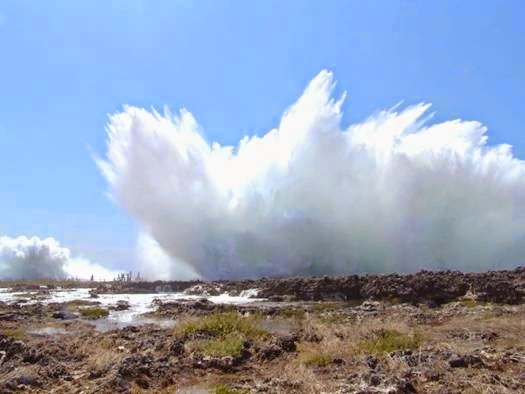 Even sea water jets that hit the rock looks very high. That is why this attraction is very dangerous and is considered haunted by the locals. Nusa Dua is a beautiful but dangerous attraction of Bali, Indonesia. It is a famous coastal region with an average temperature of hot air. I visited this awesome spot few months ago after my thousand islands tour with my wife. The name of this place is derived from two words Nusa which is the name of an island and Dua mean two it means combination of two islands.